Our Cross Back Apron is the perfect cooking accessory: as functional as a paring knife, as useful as a wooden spoon, and as classic as a Bundt pan. For this version we used our gorgeous Watercolor Linen, a lightweight fabric that will stand up to the heat of the kitchen! Watercolor Linen comes in a beautiful rainbow of semi-solid colors, each one lovelier than the next. 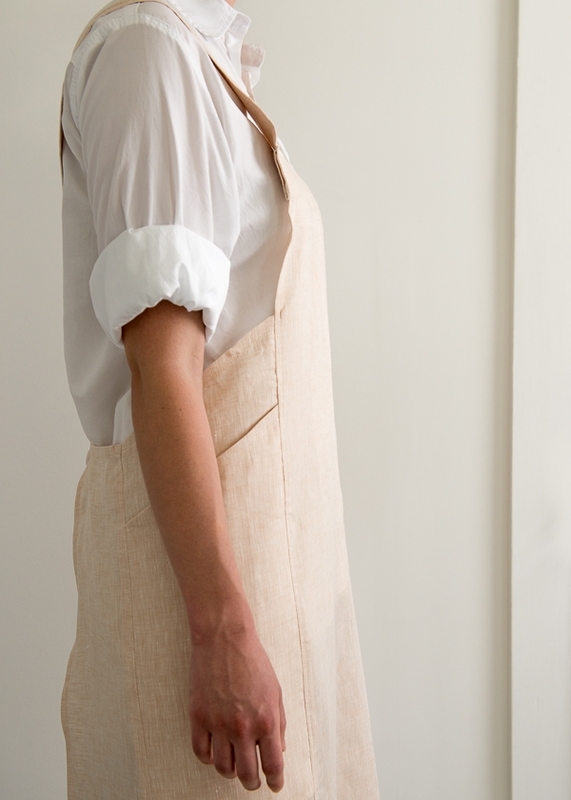 Our original Cross Back Apron was in Purl Soho’s Handkerchief Linen, similar to Watercolor Linen but solid in color. We love the new look, complex and wonderfully elegant. But whichever Linen you choose, our Cross Back Apron is definitely what’s cooking! 1 ¾ yards of Purl Soho’s Watercolor Linen. We used Pink Sand. One 110-yard spool of Gutermann’s Cotton Sewing Thread. We used color 1240. For the free pattern, please visit our original Cross Back Apron story. love this pattern — it would make a wonderful gift for foodie friends! Another winner pattern! Love this – I can’t wait to get started! This pattern is exactly what I’ve been looking for. Thanks. Thank you for the pattern, what a beautiful apron and so easy. I can not wait to get started on them. I am going to make them for my friends using their favorite animals. They have fabric for any ones likes, such as flowers, cats, and dogs. I am excited about getting started. I could not download the pattern. Can I do this when I buy the material? You don’t need to buy anything to download this pattern. You can easily download to print or save using the PRINT button! If you’re on a desktop version of the site, you will find the Print icon in the right margin just below the Save to Favorites button. If you’re on a mobile version of the site, you will find the Print icon below the pattern and above the comments. Wow! A classic beauty for any “chef” -at home or in a professional kitchen. 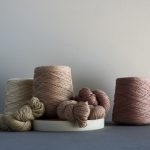 Purl Soho delivers, again! What a terrific apron! I am definitely ordering the material but have a question. 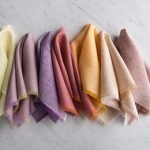 What are the differences (aside from color choices) between the Watercolor Linen and the Handkerchief Linen? Do you recommend one over the other for durability? Thanks! They are both the same weight and durability. The big difference is that the Watercolor Linen is woven with one color as its warp and another color as its weft, so it has a unique depth of color (and almost iridescence). Please let us know if you have any other questions! I am having trouble with the step where I’m to sew the side seams of the pockets and then attach them to the back. First, I attached pocket A to pocket B incorrectly, but figured that out. Now I’m stuck with the directions for attaching (what?) to the back of the apron. The first part of the pattern has you create the back pieces. The second part of the pattern has you create the pockets out of pieces A, B, and C. The step you are currently on has you attaching the finished pockets to the back pieces you made in step one! If someone out there is making 2, I would love to buy one… this is exactly what I am looking for – can no longer take the neck strain from regular strap…. Will this apron fit someone who wears a 2X? I’m leery about ordering this lovely fabric & making the apron to find out it doesn’t fit. Hi Dawn! Thanks for writing in! As the pattern is sized for “one size fits many” I can tell you – personally, I am not one of those many! Haha! My chest is 46″ and the apron fits snug. If you are interested in sizing this pattern up, it would be an easy adjustment to widen the “Front” and “Back” panels and extend the straps while maintaining the same dimensions of the pockets. We’d recommend purchasing an extra yard of fabric to give yourself room to play and if you need any help in additional measurements – please let us know! Thanks for writing in and happy sewing! I have a couple of questions. First of all, I am an experienced quilter and bag maker, but I have never made anything else (knee deep in the fine line log cabin quilt right now). This looks like a good project for trying something different. Can I cut this with a rotary cutter? I have never cut fabric with a scissors. Also, I had a problem with the handkerchief linen earlier because it is so fragile and I couldn’t cut it straight. Lots of fray. Any suggestions? Maybe cutting with a scissors is better? Maybe the watercolor linen is a slightly tighter weave? Thank you for writing in! You can definitely use a rotary cutter for this pattern. We recommend using a rotary cutter with a clear quilting ruler on a self-healing cutting mat. This will make the long straight cuts much easier and more precise than with scissors. If you don’t have these supplies already, we’ve compiled everything you need in our Rotary Cutting Tool Kit! Also, we recommend starting by cutting the long strap pieces perpendicular to the selvage first, and then cut the strips that run parallel to the selvage next. This way you’ll be working with smaller pieces when going in to make your diagonal cuts. 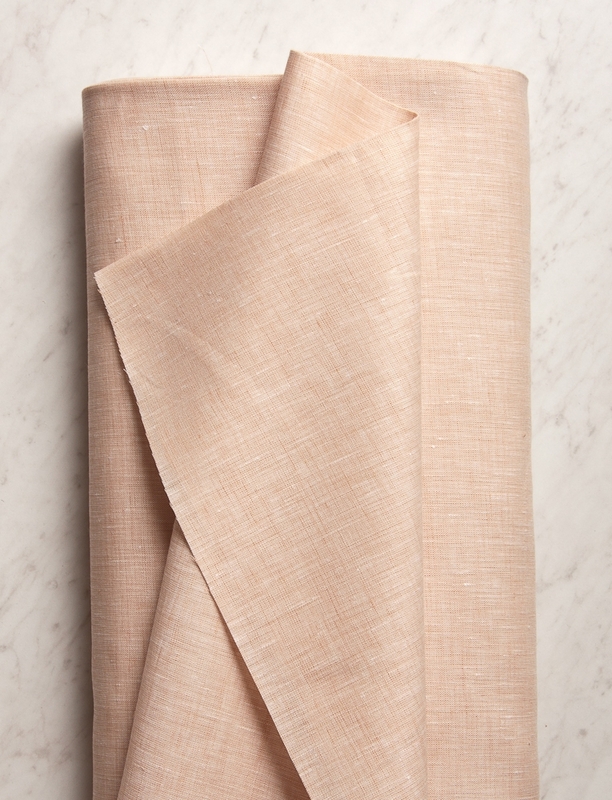 All linens tend to fray, however the Watercolor Linen cuts a bit cleaner and doesn’t fray quite as much as the Handkerchief Linen. Please let us know if you have further questions! This is a wonderful pattern, clear, easy-to-follow instructions make it a one-afternoon project. I have made four of these and they are tucked away for Christmas presents. 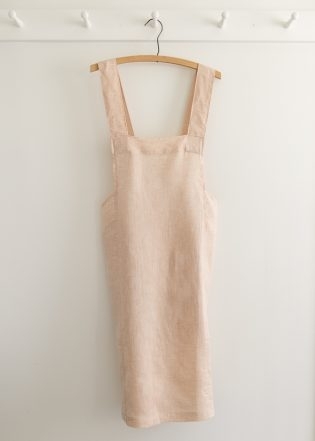 I especially like the French seams which give the apron a neat, professional look. If only you had a pattern for men. My SIL loves to cook. Thanks for writing in! 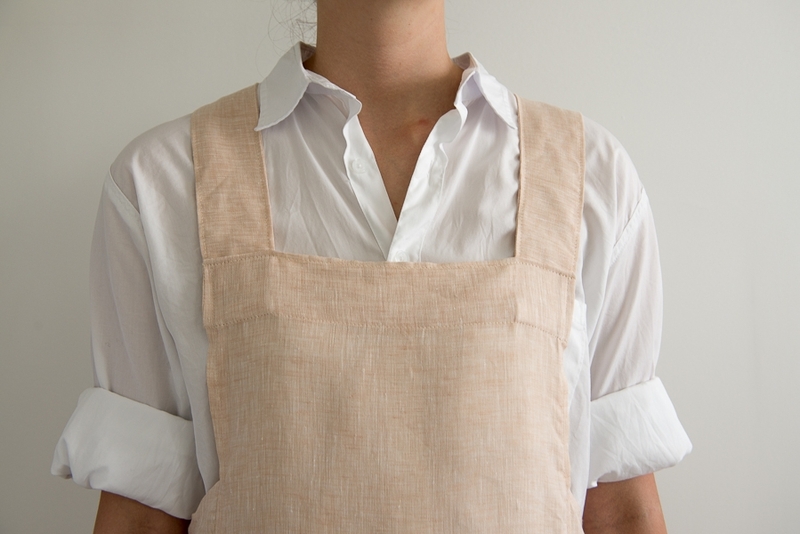 All of our apron patterns are unisex! 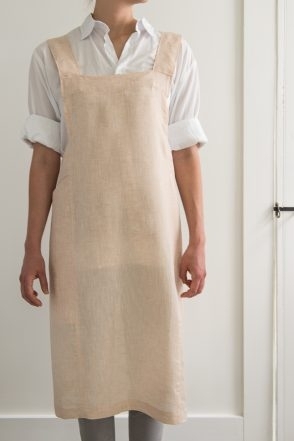 I understand that this design may not work as well for your SIL but may I suggest our Simple Linen Apron. It features and adjustable neck and a tie around the back! Recently, we remade this in watercolor linen but it work well in almost any fabric! I love this apron. Thanks for sharing. 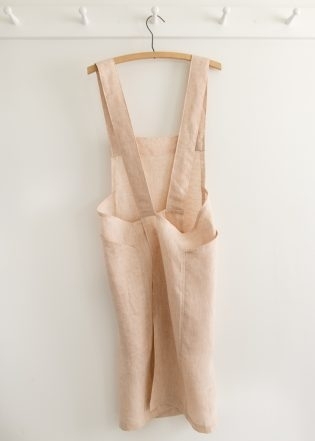 Just love this apron and am thinking about ordering some your linen, but before I do……how does it hold up when washed? Is there much shrinking? I’m a very “active” cook and my aprons take a beating and are often spattered with my efforts! Thanks for writing in! I find that the fabric holds up quite well. I made a tank top out of it last summer and wore and washed it constantly. I am looking forward to wearing it again this summer and it still looks great. I would suggest washing the fabric as you mean to wash the final piece first as any shrinking will occur on that first washing and subsequent washes should not have much of an effect. I’m new to sewing and have what may be an overly simplistic question. Does the 1 3/4 yards of fabric listed in the materials include an allowance for the shrinkage that occurs while prewashing the fabric? Or, should extra fabric be purchased, if I will prewash? If the latter is true, is there a general rule for how much fabric will shrink when prewashed? Great question! If you are using the fabric suggested, the amount listed, is sufficient for the project. Linen, in general, shrinks very little when washed and we have accounted for that in this pattern. There is no rule of thumb for how much fabric shrinks when washed. Some fabrics shrink little or not at all and other fabrics have a shrinkage rate of up to 20%. Generally, when using the fabric suggested for a pattern, the shrinkage is accounted for in the fabric recommended. I love that this has no ties! They are such a pain! Thanks for another nifty free pattern! Thanks for the tutorial! 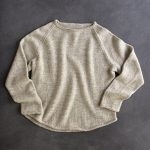 Do you think this would be fine in Daily Linen? Or would the extra weight of that fabric translate into too much bunchiness/stiffness? Thanks for writing in! While our Daily Linen is thicker than the linen used here, I do think that it will work well for this pattern. 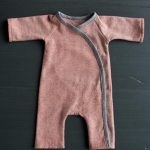 I have made several pieces of clothing using the Daily Linen and do not find it too bulky. The apron will certainly be a bit more substantial but I think that it will be lovely! Can this be made without pockets? 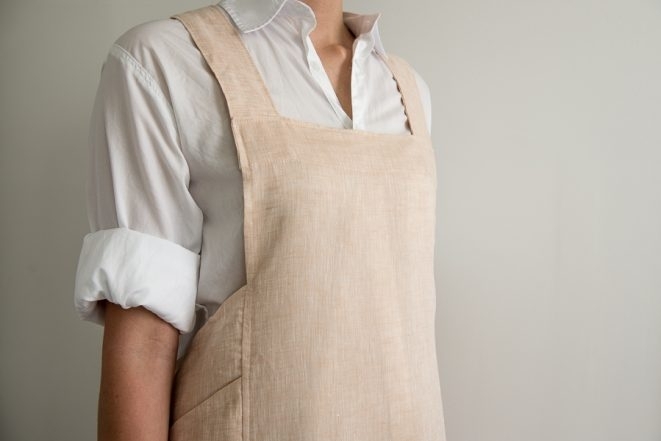 I’ve never really had a need for any pockets in previous aprons I have used in my kitchen. Can I get away without them? Thanks for writing in! 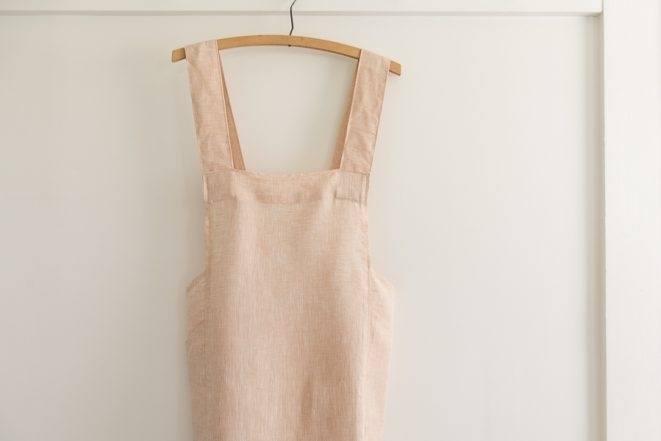 You can certainly make this lovely apron without pockets! I think that it would still look quite smart indeed! Do men enjoy this design or would one with the ties be better? Thanks for writing in! We have seen both men and women use these aprons! 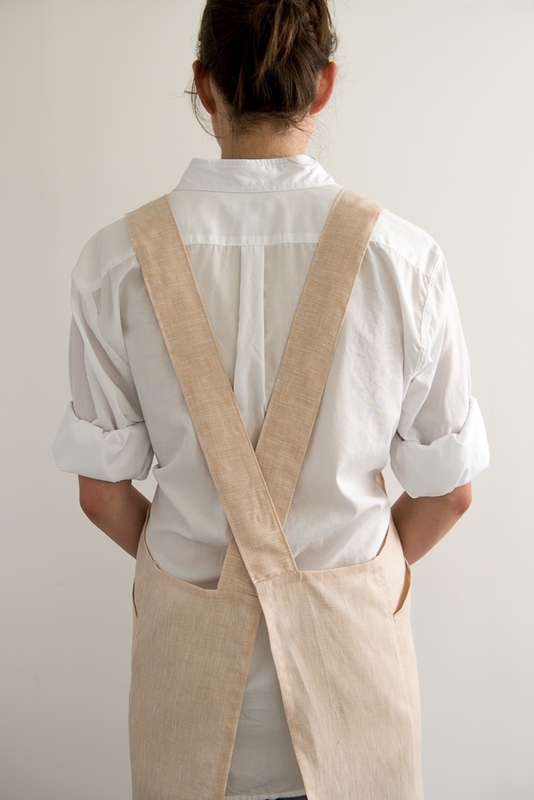 If your intended recipient does prefer ties, you can try our Simple Linen Apron! I used this pattern for my costume in Annie. It is set in the 1930s and I was playing the cook. I got a lot of compliments on it. How do you put this apron on? Thanks for writing in! This apron simply slips on over your head! I just cut out this apron…I bought the indigo Essex and it’s only 42inches wide…I bought extra but I am piecing the straps which is ok but I barely had enough! What amount of fabric should I purchase if using 42 inch – I believe I bought 2 1/4 yards. I wanted the Essex so it wouldn’t wrinkle so much….Thank you! Thanks for writing in! I’m glad you were able to make it work! After a bit of diagramming on graph paper I think you could comfortably cut everything out of two and a half yards of 42 inch wide fabric without piecing the straps, but it wouldn’t hurt to get two and three quarters or three yards to be on the safe side! I can not down load the pattern. I have tried to use the print button under the save to favorites but that does not print the pattern. Thanks for reaching out! You can find the full pattern in our original Cross Back Apron story! I hope this pattern becomes available once again. I clicked the link for the free pattern but reached a page that said it’s not available. What’s up? Looks like a beautiful project… if only…. Thanks for writing in! This lovely pattern is still available! I have fixed the broken link and will include it here for you as well! This is a nice pattern, but it should come in sizes. It runs very narrow, and doesn’t hang right if the wearer is wider than the model in the picture. ¡Hermoso! ¡Muchas gracias por compartir! What a great idea! It’s too late to make a couple of them for Christmas baking, but I’ll be ready for next year. Thanks for the pattern.